ARE THERE MORE THAN A DOZEN RICH COLORS? Trex decks will not rot, warp, crack or be devoured by termites. Period. 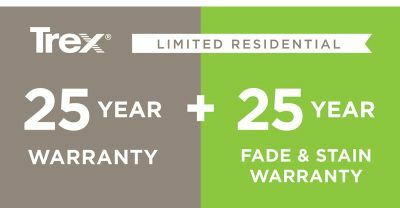 In fact, while all of our decking and railing products offer a 25-Year Limited Residential Warranty against material defects, our high-performance lines add an additional layer of coverage with our 25-Year Limited Residential Fade and Stain Warranty. Read details on our warranties. We invented the category, but we didn't stop there. That same low-maintenance innovation is available in Trex railing, outdoor lighting, industry-first steel deck framing and more, creating an entire Trex system of outdoor living. Consider it a package deal you can get nowhere else. Visit our Ideas Gallery to see Trex performance from the ground up. A few of our favorite colors that can be used in hundreds of decking and railing color combos. At Trex, decking is comprised of 95% recycled materials—namely, recycled wood, sawdust and plastic film. This earth-friendly formula, coupled with groundbreaking green processes, makes it hard to find a company more actively aware of its impact on the environment. All high performance & low maintenance. One for every budget. It's nice to be recognized for good work. It's even nicer to be recognized year after year. As the leader in outdoor living we’re dedicated to constantly improving our products and expanding our portfolio. It’s hard work, but the kind and continuous praise from industry experts helps keep us going. At Trex, we’re proud that our dedication to performance, beauty and reliability shines through time after time. We're not in it for the awards. But that won't stop us from showing them off. "Best of Houzz" design award, 5th year in a row. 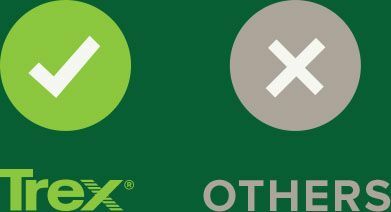 Trex earned the #1 spot for decking in the inaugural PRODUCTS brand use study, based on a survey of 300 builders, remodelers, designers and architects re: the brands they prefer to work with most. "Best of Houzz" design award, 4th year in a row. Trex® secured the highest number of top spots in Builder magazine's 2018 Brand Use Study. For the 11th year in a row – an unprecedented streak achieved by no other manufacturer – Trex® was honored as the "brand used most" and "brand used most in the past two years" for the composite/PVC decking category. Trex also took the top position in the "quality" category in this year's study. Trex Enhance® and Trex Transcend® appear in the "Top 100" lists featured in the August issues of Professional Builder and Professional Remodeler. Both lists are compiled in response to reader interest and requests received over the past year. Trex Signature railing earns a spot on Green Builder Hot 50 Products list. Readers' Choice award for greenest brand in the decking category from Green Builder magazine. "Best of Houzz" design award, third year in a row. For the 10th consecutive year, the world's number one decking and railing brand, and leader in high-performance, low-maintenance outdoor living products, has captured three first-place rankings in Builder magazine's annual Brand Use Study: Brand Most Familiar, Brand Used Most, Brand Used Most in the past 2 years. Trex honored as Environmental Vendor of the Year by The Home Depot. Trex voted "Best Decking" by readers of Builder and Developer magazine. Trex earned six (6) Awards for Design Excellence (ADEX) from Design Journal: Platinum awards for Trex Outdoor Lighting, Aluminum Gates, and Trex Transcend Island Mist; Gold awards for Trex ADA-Compliant Handrails; Spiral Stairs; and Trex Transcend in Havana Gold. Ron Kaplan named to Top 50 Most Influential Virginians by Virginia Business magazine. Trex won Golden Hammer award presented by Hardware + Building Supplier magazine, the awards are based on the publication's annual survey of retailers and distributors who were asked to identify the brand that offers the most outstanding benefits for their business. Based on the survey results, Trex earned first place in the decking category. The Engineered Artistry campaign from Trex won the American Business Award (commonly known as the "Stevie® Award") for Marketing Campaign of the Year in the Home Furnishings and Appliances category.